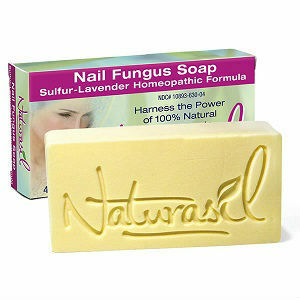 Naturasil Nail Fungus Medicated Soap is an all-natural, anti-fungal cleansing medicated soap. It claims to help treat fungal infections and nail fungus as well as other skin problems such as eczema and acne. Each bar of soap comes in a colorful rectangular box. I looked into whether Naturasil Nail Fungus Medicated Soap was a good choice for fungus sufferers. Naturasil Nail Fungus Medicated Soap is a homeopathic natural plant, which is Palm Kernel and Coconut Oil based. It contains micronized sulfur soap with pure lavender essential oils. Due to their naturally occurring calming properties, the combination of sulfur and pure lavender assists in the treatment of nail fungus infections. Naturasil Nail Fungus Medicated Soap is recommended to be taken at least two times a day for 4 – 10 days. Naturasil Nail Fungus Medicated Soap currently retails on the website for a special price of $19.95 for two bars of soap. At $10 per bar of soap, this is quite expensive, but if it does as it claims then it could be a small price to pay for an easy way to cure a fungus. The website that sells Naturasil Nail Fungus Medicated Soap has a 90-day money back guarantee, which is a reassurance for buyers. There was just one review on the page, it gave Naturasil Nail Fungus Medicated Soap a 5-star review, also a good sign. The page states that they have a very high re-order rate for the product, which indicates buyers are satisfied. While I could not find any negative remarks about Naturasil Nail Fungus Medicated Soap, I also could not find any overwhelming evidence that this product will cure nail fungus. It is an all-natural product, which may be of comfort to some buyers, and the website offers a 90-day money back guarantee, which is also reassuring. Jack Stevens	reviewed Naturasil Nail Fungus Soap	on September 10th	 and gave it a rating of 3.